Bangladesh has an overwhelmingly agricultural economy . Agriculture accounts for 32%of its gross domestic product ( GDP ) , and absorbs 63% of the country’s labor force . Sustained government investment in irrigation facilities , rural infrastructure , agricultural research & extension services has helped Bangladeshi farmers achieve dramatic increase in agricultural production . Bangladesh is a land of farmers & farming thus agriculture is the backbone of this developing nation . The rich & fertile land is a blessing which providing many types of rich vegetation . But now food prices have become a major talking point for the media . Under mounting pressure , the government has unveiled some short term measure to curb prices . The problem , however , is not short term in nature . A timeline of food prices of common food items serves as a reminder that the rapid food price inflation dates back to several years & even more in the case of certain items like seasonal fruits , vegetables , rice , wheat etc ( Source : Financial Express ) . The main purpose of this research is to find out the causes behind the inadequate profit earnings by the farmers , intermediary intervals in every step , thr proper food marketing system that is preferable & consumer reaction towards the current situations & suggestions . Vegetables & seasonal fruits are part & parcel to the people of Bangladesh to fulfill the nutrition factors . The price rise is variously blamed by the different government representatives on last year’s drought ( monga ) , on ” dysfunction in distribution ” . The government has been fairly candid in admitting its helplessness in combating the price rise . The Planning Commission Deputy Chairman has made public his belief that policy changes to make credit dearer are not a remedy . Imports without a government subsidy are also not possible as prices internationally are higher ( Bangladesh Bureau of Statistics). Diversification into vegetable crops and increasing commercialization can support the development of the agricultural sector in several ways . Commercialization is characterized by households moving from subsistence systems into semi-commercial & commercial systems (with the main objective of achieving food self-sufficiency ), thereby maximizing profits & generating surplus ( Pingali & Rosegrant 1995 ) . Reardon & Barrett 2000 ) . Commercialization can take place on the output side-when the farmer sells their products on the markets-or on the input side with increased use of purchased inputs ( Von Braun 1995 ) . The nature of the Agriculture Marketing System in Bangladesh is rather complex which stems from the fact that there are innumerable small farmers spread all over the country , where marketable surplus or marketed quantity of the crops they grow is very small . Collection of these widely dispensed and small-marketed quantities is bound to be costly and insufficient . There are almost 13098 ( DAM study 2000 ) small , medium and big sized markets in the country . In Bangladesh except the activities performed in connection with Public Food Distribution System ( PFDS ) and agriculture price and marketing policy decision of the government the trade in all agricultural products is largely handed by the private sector . The general agricultural marketing policy of the government is to allow free play of the market forces in determining the price and encourage larger participation of the private section ( Md. Fazlur Rehman ) . In practice, how can prices be stabilized so as to secure producer and trader incomes and encourage the investment required to modernize production and markets? For researchers, the answer depends on the type of instability. If the instability is “imported” from international markets, State intervention is required. Price stabilization on a global scale necessarily calls for international market regulation, while on a national or regional scale, it involves controlling borders so as to compensate for the effects of international price variations (as far as WTO regulations permit this, since they forbid variable import taxes). If the instability is “endogenous”, public intervention may be required to calm market speculation fever. This may entail regulating markets, resorting to international markets, or using public stocks. Lastly, if the instability is “natural”, the solution lies in getting to the root of the problem, by modernizing food product production and trade structures. However, modernization inevitably takes time. Moreover, it calls for a degree of prior price stabilization, since modernizing farms and markets relies on investment on the part of producers and traders, who are reluctant to invest if prices are very unstable. This prior price stabilization will thus mean using fast-acting instruments such as public stocks or border controls . sufficiently wide, flexible price range to determine the thresholds for State intervention. These “intervention prices” will have to be announced publicly, be credible, and be respected, otherwise public intervention could well increase uncertainty among market operators rather than reducing it ( CIRAD ) . Volatility is a directionless measure of the extent of the variability of a price or quantity. It follows that volatility measures derive from the second moment of the distribution of the price or quantity in question, or transformations thereof. Economists generally focus on the standard deviation of logarithmic prices since this is a unit-free measure. For low levels of volatility, the log standard deviation is approximately equal to the coefficient of variation. Economic series typically exhibit trends. Measurement of volatility therefore requires the series to be detrended since otherwise trend movements will be included in the volatility measures. Because trends are rarely linear and deterministic ( Kim et al 2006 ; Kerald & Wohar 2006 ), detrending requires a trend model that implies a judgemental trade-off between attribution of variability to the trend itself and to variation about the trend. The volatility measure can therefore depend on the choice of the trend model in an undesirable manner. In looking at price volatility, economists often circumvent these issues by measuring volatility as the standard deviation of price returns, i.e. the standard deviation of changes in logarithmic prices. We adopt this standard measurement convention. Academic and policy analyses have tended to focus on price levels rather than volatilities. An exception is who showed that agricultural price volatility was low in the 1960s but was higher in the 1970s and the first half of the 1980s ( Gilbert 2006 ) Volatility fell back in the second half of the 1980s and the 1990s but remained well above its 1960s level. credible, and be respected, otherwise public intervention could well increase uncertainty among market operators rather than reducing it ( CIRAD ) . The proposed research is about consumer perception towards the rising price of vegetables & seasonal fruits . It will also focus on farmers position & distribution channel & their effects on the marketing of vegetables & fruits . Again achieving food self sufficiency thereby maximizing profits to only to the distributors & giving negative signals towards the consumers ( Pingali & Rosegrant 1995 ) , ( Haque 2000 ) . To find out the consumer perception there can be selected variables or factors . 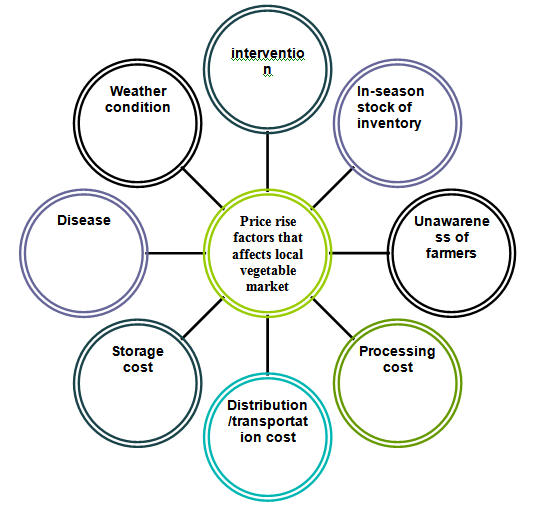 These independent variables are : intermediaries’ intervention , in-season stock tendency of businessmen , farmers’ unawarness of price news , distribution/transportation cost , processing cost , storage cost , weather condition , disease. The effects of these variables will be evaluated in this study. A survey was conducted for one month using a semi- structured questionnaire through interviews among a cross section of people .Information were also collected from some published reports , papers and some official documents & also reviews on the existing information in different aspects of price increasing in the purchasing & attitudes of consumers on it . Nature of the study is descriptive . The information required are both primary and secondary . The required primary data were collected from different places of Dhaka city . And the secondary data were collected from institutions like BADC , BRRI , Department of food and nutrition , genetic engineering and biochemistry of Dhaka University etc . The main objective of the research is to identify the ways for improving the situation regarding price rise in the local market. So data is collected from some primary sources by preparing a questionnaire which is open ended in nature. Primary data sources are the independent producers of vegetable products, the exporting firm. Secondary data have played an important role because maximum information is reviewed from these sources as primary data was hard to find out. Secondary data has been reviewed and collected from different articles, published journals, and websites in order to meet up the gap of information available. Here some data has been collected also from relevant topics as well as substitute products because the data is not available about vegetable goods in some matters. The nature of the research is exploratory in nature as the article tried to emphasize on the problem which can further be studied for making decisions about price rise condition. In case of selecting the elements for sampling, judgmental method of non probability sampling has been used because of the fewer vegetable product producers are available in Dhaka. Informal questionnaire which is given in the appendix has been used as an instrument, in many cases the questionnaire was conducted in sequence but without directly asking the respondents. The sample size is very small only 30. In some cases, instead of face to face interview telephone survey method has been conducted to collect data. In case of analyzing the data no statistical method such as ANOVA, ANCOVA, REGRESSION, CONJOINT has been used because the natures of the questions are open ended as well as secondary data are qualitative in nature. Instead of using any statistical techniques data are simply analyzed in light of different models developed by different theorists. Personal in-home interview & personal interview were selected as survey method . Survey instrument was proposed as questionnaire which followed the 5 point likert scale standard. The findings are based on responses of small sample size . The nature of the Agriculture Marketing System in Bangladesh is rather complex which stems from the fact that there are innumerable small farmers spread all over the country , where marketable surplus or marketed quantity of the crops they grow is very small . 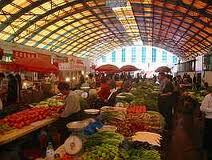 The number of middlemen are present in vegetables and fruit markets . The rise of middlemen specializing in such activities as storage , transportation , processing , and retailing .These cost more .This is one of the reasons of fluctuating vegetables and fruit prices . Some businessmen stock the vegetables and fruits during the season and market them in off-season at higher prices . This is another reason for price fluctuation in vegetables and fruit market . Farmers are unaware of price news . Some middlemen and also some businessmen take this unethical advantage . they buy vegetables and fruits at lower prices from farmers and sell them in Dhaka city at higher prices . This is a common practice in our total food market . Almost no processing is involved for the daily price list on vegetables and seasonal fruits, Processing of growers’ price data does not follow any definite time schedule . The reasons behind price fluctuation lie in the inelastic supply and demand curves for agriculture and the unpredictable changes in food supplies as a result of weather condition , disease and other factors . because of the inelastic curves , shifts in either demand or supply will result in proportionately larger price changes . In turn , instability of farm incomes is directly related to unstable farm prices . Farmers are punished in market place when they succeed in producing good yields and high output . The rightward supply shift lowers farm prices and , to add insult to injury , this movement along an inelastic demand curve reduces gross farm income . Intermediaries’ intervention: Middlemen buy products from farmers at lower prices and sell them in Dhaka at higher prices . This is common practice in our country . In-season stock tendency of businessmen: Some businessmen stock products during the season and sell them in off-season at higher prices . Farmers’ unawareness of price news: Farmers are unaware of market price of their products due to lack of proper information system & control power. Distribution/transportation cost: Transportation cost is higher which is sometimes added to the price of the product. Toll on the way to Dhaka creating more pressure on price. Processing cost: Processing cost is also higher. Weather condition: Unfavorable weather condition may hamper production and thus price . Disease: Because of various diseases price of vegetables & fruits may fluctuate . 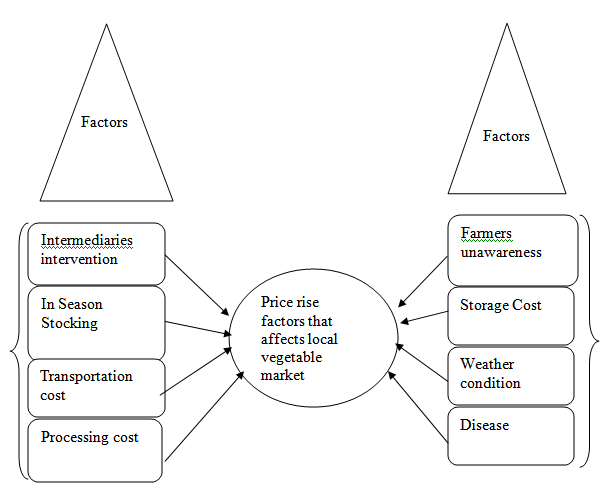 Figure: Factors causing price rise. Food prices have become a major talking point for the media. Under mounting pressure, the Government has unveiled some short term measures to curb prices. The problem, however, is not short term in nature. A timeline of food prices of common food items serves as a reminder that the rapid food price inflation dates back to several years & even more in the case of certain items like seasonal fruits, vegetables, rice, wheat etc.This research found the causes behind the inadequate profit earnings by the farmers, intermediary intervals in every step, the proper food marketing system that is preferable & consumer reaction towards the current situations & suggestions. The proposed research was conducted only in Dhaka city. Again there were random & non-random sampling error because of small sample size. There may be response error for their inability to recall and unwillingness to participate. This research can be used for future research if sampling error will be reduced . Under this research sample size is small. The existing random sampling error can be reduced only by increasing sample size. Response error can be can reduced by encouraging respondents so that they will be willing to answer. Anderson , J.R. and J.A. Roumasset . 1996. Food insecurity and stochastic aspects of poverty. Asian Journal of Agricultural Economics. AVRDC ( Asian Vegetable Research and Development Center ). 2000. AVRDC-USAID Bangladesh Project. Completion Report. Shanhua, Taiwan : AVRDC. BBS ( Bangladesh Bureau of Statistics ). 2002a. Census of Agriculture – 1996 Zila Series : M.O.P. Planning Division. Dhaka : BBS. Singh, Shukwinder, 2006. “ Farming for agricultural development & diversification in Punjab “ . Indian Institution of Management , Ahmedabad . Ahsan , M.N. and M.N. Ahmed. 2003 . Country paper : “ Bangladesh. Impact of land utilization systems on agricultural productivity. ” Tokyo : Asian Productivity Organization. Ali, M. and V.T.B. Hau.2001. Vegetables in Bangladesh. Technical Bulletin No. 25. Shanhua, Taiwan : Asian Vegetable Research and Development Center .